A starry cast that includes Ben Kingsley, Elle Fanning, Nick Frost, Tracy Morgan, Jared Harris, and Richard Ayoade gives voice to The Boxtrolls—the latest enchanting stop-motion animated featured from Laika, the studio behind Coraline and Paranorman—the tale of tiny, tinkering monsters that live underground; the city that fears them; and Archibald Snatcher (Ben Kingsley), the villain that hunt and exploits them. 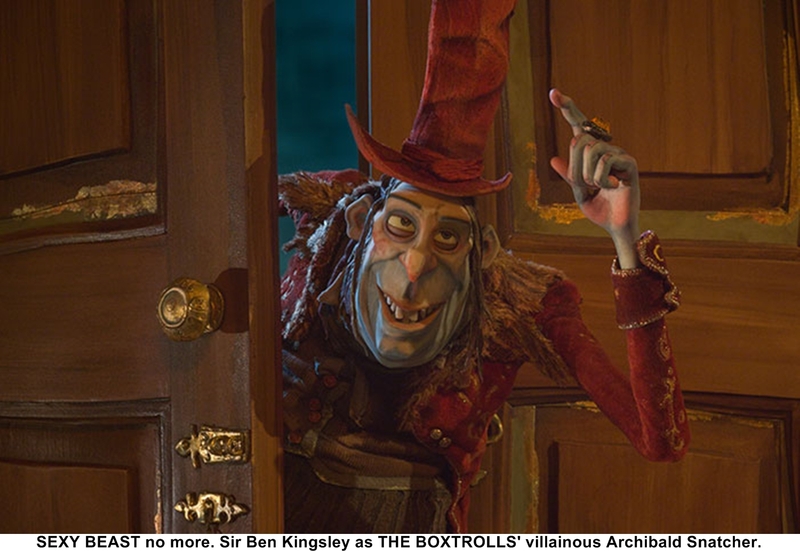 For directors Graham Annable and Anthony Stacchi, casting those famous voices and aligning voice with character were key in ensuring The Boxtrolls‘ success. The filmmakers had a huge wish list of voices, but Annable and Stacchi realized that it wasn’t enough to simply think an actor was right for the part. They had to be sure, and so they put each voice to the test. “We knew very early on that we liked the Bran Stark character from Game of Thrones, Isaac Hempstead Wright, we liked his voice,” says Stacchi of the actor who would eventually voice Eggs, the human child raised by boxtrolls. “We edited all the dialogue we could get from Game of Thrones and from interviews that Isaac had done, then we cut it over drawings of the Eggs character and paintings of the character and even sculpture of that character to see how it felt with that voice coming out of that body. Kingsley was number one on the directors’ wish list, but even his voice had to pass muster, Annable and Stacchi choosing from his five-decade long career his most adult (not to mention most profane and scabrous) role to test and see if he was right for their family film.